I’m all about the natural makeup look and with the warm weather here I’ve been into items that are easy to apply and effortless to touch up on-the-go. I’ve teamed up with Nordstrom to share a few new makeup bag finds along with some previously launched staples that I’ve been loving lately. I’ve always been a sheer glossy lip or tinted balm kind of person and right now I have tons inside my bag. I featured some of my favorite neutrals last week. Today I’ve rounded up some items that will give a bit more color and life. 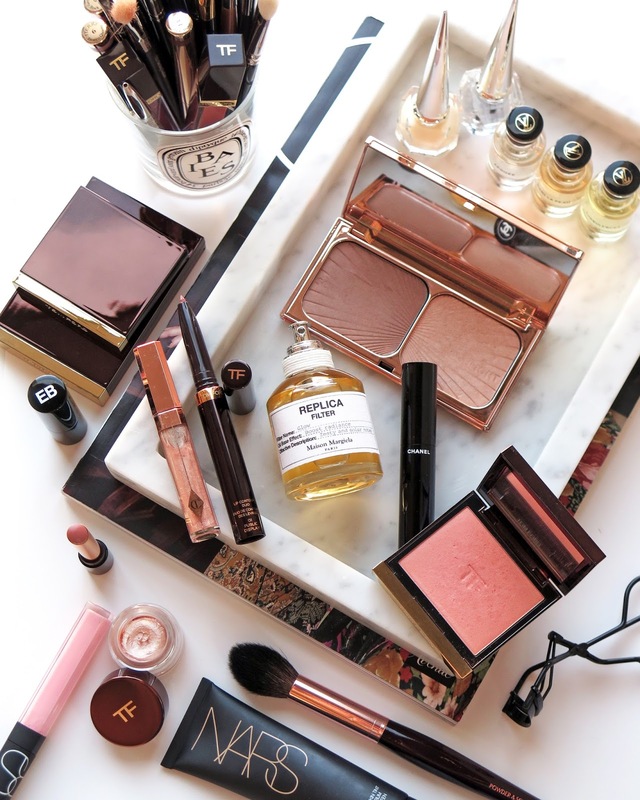 Warm weather beauty loves, makeup beauty details and swatches below. With hot weather I’ve been using more dry shampoo simply to refresh and touch up. The humidity levels are increasing here and so I’ve been experimenting with more. The Oribe Gold Lust Dry Shampoo has been a long-time favorite. For touch ups I also really like the Armani Luminous Silk Powder Foundation. It sounds like it could be heavy based on the product name but it’s one of the most lightweight powders I’ve tried and I use to set my makeup and also for touchups. It looks natural and doesn’t cake up. Bronzer has always been a must for me. I’ve reviewed quite a few luminous bronzers, like the Hourglass Ambient Lighting Bronzers which double as a bronzer and highlighter in one. Some of you prefer a matte finish and the one I reach for the most is the Tom Ford Small Bronzing Powder in Terra. It’s sheer to medium and one of the lightest colors I own making it wearable and effortless. Another great option is the new NARS Sun Wash Diffusing Bronzer in Seaside. It’s the lightest option and looks peachy in the pan but wears beautifully on the face for a natural wash of color. Also I know some of you prefer the no-shimmer look, but the MAC Mineralize Skinfinish in Global Glow is one of the prettiest glowy bronze shades I own. I wear it on both the cheeks and eyes. Anytime I wear it on the face I always get asked, “what’s that pretty glowy highlight you have on your face?” and it’s usually this one. These look dark because I swatched them with a heavy hand but I assure you they can sheer out on the face for a more natural look. Lip products are my weakness. I always carry so many with me even though I really only need 1 or 2 products max at any given time. The Clarins Instant Light Lip Perfectors are the definition of effortless beauty when it comes to tinted balms. I have and love all the shades, Apricot Shimmer is a light sheer peach. You can just add a bit of liner like Charlotte Tilbury Pillow Talk for color and you’re all set. They’re really easy to touch up too. Chanel Rouge Coco Gloss in Melted Honey is a great sheer gold shimmer to add a nice soft glow. It’s sheer so if you need more color there are others to look into like Douceur or Amuse Bouche. They’re moisturizing and add a pretty shine to the lips. Louboutin launched new Meatlinudes Loubilaques and I’m OBSESSED. All the colors are amazing! Detailed review on the entire collection to come soon but the first one I’ve put on is Bronzissima which is the prettiest flawless bronze shimmer. 100% worth the splurge. Clarins added new shades of their Instant Light Lip Comfort Oil and two of them transform in color to your lip pH to create a unique color. Tangerine is the best kind of juicy peach red for summer. Tom Ford launched their Clutch Sized Tinted Balms early spring and I’ve been obsessed for months. There’s a light peach shade for the neutral lip lovers in L’Odissea but I adore the sheer brights like Fathom. Last but not least the Tom Ford Cream Powder Eye Duos have been a staple since they first launched and Naked Bronze and Golden Peach have been favorites. They’re so easy to apply even if you’re on the go. I can apply these with the fingers and it’s pretty much goof-proof. This year they launched three new shades in Young Adonis, Sun Worship and Paradiso. I’ve already reviewed these new launches but re-swatched them side by side for reference. Paradiso is indeed different from Golden Peach but they are very similar so I don’t think you need both. I prefer the cream in Paradiso and the glitter in Golden Peach. That wraps up some of my favorites for warm weather beauty! With the heat I’ve been experimenting with different bases and will have a roundup on those in the upcoming weeks. For now I hope you liked this post for ideas on effortless beauty. I included some non-neutrals but colors that are still easy to wear and natural looking. As always I’d love to hear your favorites. What are you loving these days as we transition from the spring to summer season? You can find all my picks at Nordstrom. Many thanks Nordstrom for partnering to sponsor this post. Press samples include lip items from Clarins and the Tom Ford Clutch Balm.